Our trainee, Michael Byrne, is fronting our new campaign - This is Learning Difficulty at Work to highlight that people with a learning difficulty can excel in employment. Michael is out on the billboards, buses, kiosks and bus stops highlighting to the public that a person with a learning difficulty can excel in employment if given the right support. The campaign aims to show a real beneficiary of Stepping Stones NI at work and to highlight to employers in particular that a person with a learning difficulty can do the same job as someone who does not have a learning difficulty. A key message of the campaign is “support that gets results”. Michael and his family are delighted with the support that he has received from our team and his employer and have endorsed what we do through the campaign. As Michael states “the support from Stepping Stones NI works. I have a learning difficulty and I want to show other people who have a learning difficulty that they can get a job that they love just like me”. Micheal was supported by our team to gain valuable training and confidence that led to a permanent job as a Recreational Assistant at Lisburn Bowl. Together with his employer we continue to support Michael in his role. Michael’s Manager, Aoife Loughran who is Operations Manager at Lisburn Bowl comments “Michael is a committed and dedicated member of our team. 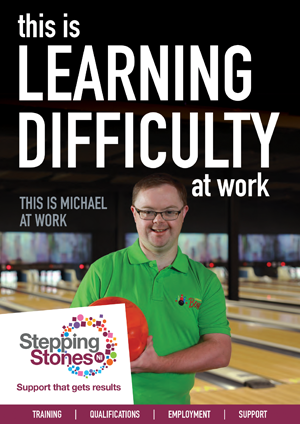 We worked with Stepping Stones NI to make reasonable adjustments to working conditions and environments and Michael has excelled. We have seen the true value of working with Stepping Stones NI as we have gained a valuable member of staff. I would strongly encourage other employers to consider offering work placements in partnership with Stepping Stones NI. The team are extremely knowledgeable and supportive of the people they support. We are delighted to support the campaign and to supporting diversity in the workplace”.